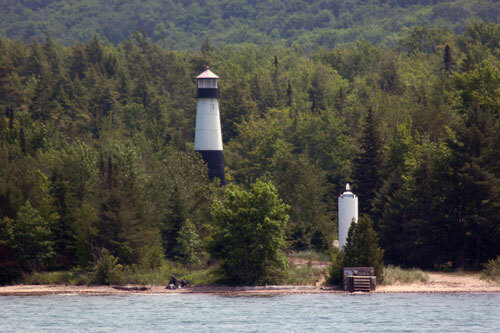 In order to guide mariners through the western entry into Munising Bay, the Lighthouse Board erected a pair of range lights on the mainland east of Bay Furnace in 1868. 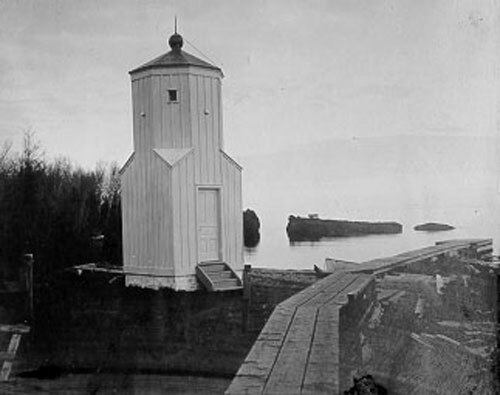 Known as the “Grand Island Harbor Range", the front range structure took the form of a 19 foot tall octagonal timber tower similar to this little structure erected at Eagle Harbor almost a decade later. The Front Range structure of the Grand Island Harbor Range was identical to this one built at Eagle Harbor. 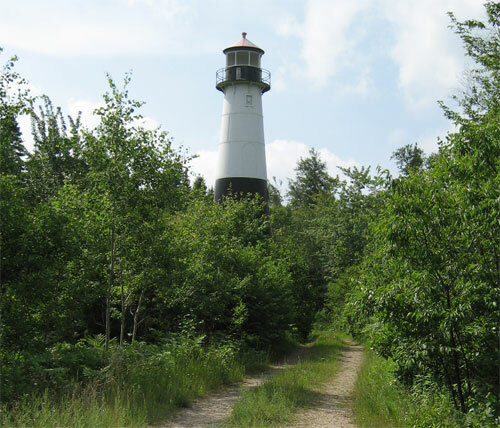 Between 1865 and 1877 a number of identical range light stations were established around the western Great Lakes. Among others, such stations were established at Copper Harbor and Eagle Harbor on Lake Superior; Baileys Harbor on Lake Michigan and at Presque Isle on Lake Huron. In all cases but the Grand Island Harbor Range, the rear range structure consisted of a small timber frame keepers dwelling with a lantern atop its roof, of which this photo of the Baileys Harbor rear range structure is typical. Because of the lay of the land, the rear range light at the Grand Island Harbor Range needed to be taller than those at any of its sister stations, and rather than design a new structure from scratch, the existing plan was modified to include a taller tower and gallery. 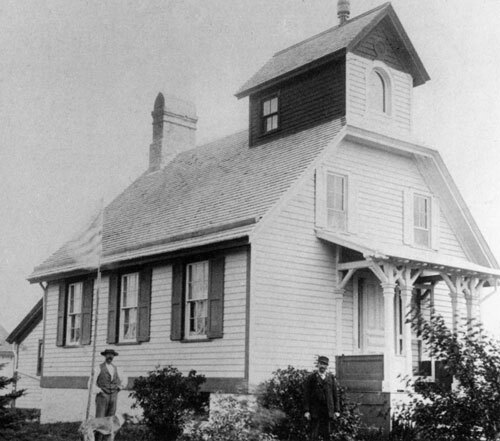 The second floor of the dwelling was also modified with dormers to provide additional living space within the roof. These modifications combined to create a noticeably more substantial structure, as shown below. With advancements in acetylene technology and the adoption of the Sun Valve through which a light could be automatically switched on before dusk and off after dawn, it was decided to automate the Grand Island Harbor Range in 1913. Then 46 years old, the decision was made to replace the old wooden buildings with newer structures requiring less maintenance. The front range was replaced by a 26 foot skeletal iron tower with an integral acetylene storage building in its base, and the rear structure was replaced by a 64 foot tall conical steel and iron tower. This structure is still standing as shown here. Rather than demolishing the old Grand Island Harbor rear range structure, the decision was made to offer the building for sale, with the stipulation that it be removed from the property. 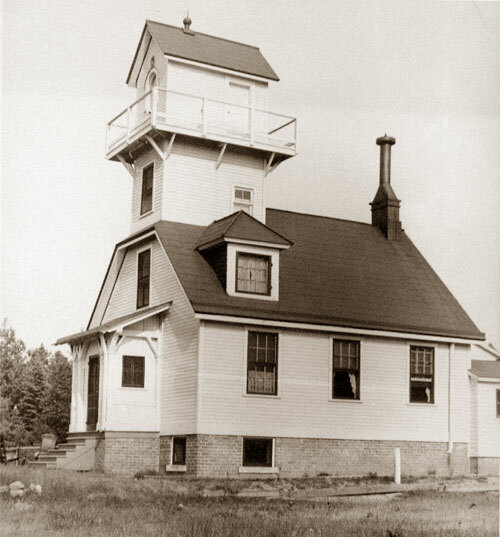 The old lighthouse was thus sold, its tower and lantern removed and the entire building was moved approximately 3 ½ miles to downtown Munising, where it was placed on a new foundation and modified to serve as a private dwelling. 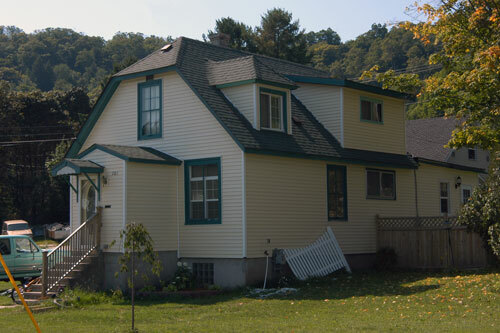 The structure still serves as a private home at the corner of West Superior and Oak Street. While it heritage is lost to most people who pass by the building, its proud heritage is still very recognizable, as can be readily seen in the recent photo below. With changing commercial maritime traffic patterns and navigational capability, it was determined that the Grand Island Harbor Range was no longer necessary. In 1969, the light was extinguished in the rear tower, with the light on the skeleton iron tower of the former front range left illuminated, and renamed “The Bay Furnace Directional Light” This structure was itself replaced by a cylindrical “D9” tower in the mid 1980's. 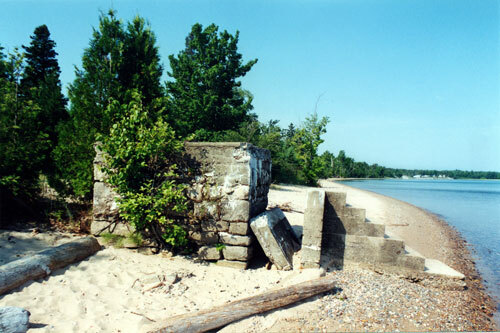 The old steel and iron rear range structure still stands today behind the functioning Bay Furnace Directional Light, and while it has been erroneously referred to as the “Christmas Light,” the “End of the road rear Range” and the “Bay Furnace Rear Range Light” by various sources, you now know its true heritage. It is the old rear light tower of the Grand Island Harbor Range. If you take the time to walk down to the water's edge, the old concrete steps and foundation of the 1913 skeleton iron tower can still be seen in front of the D9. A closer look shows remnants of the old tower legs protruding from the concrete where they were severed with a gas torch.